Workers compensation expert guides employers to implement injury managment best practices. Margaret Spence is an expert at showing companies how to slash their workers' compensation cost by implementing strategies that drastically reduce injury rates, increase productivity and energize employees to work safely. Remember, you can write the most effective safety handbooks, implement the best polices and still have injuries - the key is understanding the workers comp system and navigating it sucessfully. 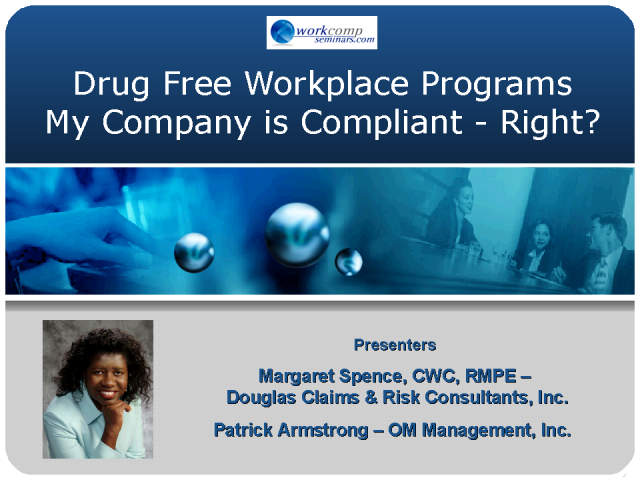 Drug Free Workplace Programs - Are you compliant? October 19 to 23 is National Drug Free Workplace Week - we are hosting this webcast to dispell the myths about drug testing and educate employers on establishing compliant drug free workplace programs. Our Guest Host - Patrick Armstrong is an expert at helping employers set up drug free workplace program - we are going to ask him the key questions about the process and get his insight on effective drug free workplace programs. Is your company a sitting duck for litigation? Are you asking to be sued? What prompts employees to file injury claims and hire attorneys? Why do employee risk everything waiting for a settlement check? Who wins in the litigation game? Join us for a great discussion. Do you understand the interaction between FMLA and Workers Compensation? Do you understand the ADA exposures created by injuries? What happens when ill and injured employees try to return to work and you send them home? What happens if you terminate them? Join us and you will learn the pitfalls of blending workers comp with HR policies. I'm Not Coming Back to Work and You Can't Make Me! So your injured employees don't want to come bakc to work - what are your options? Can you terminate them? Should you terminate them? What are your options when injured employees refuse to return to work after an injury? We will discuss your options and offer concrete solutions. Workers Compensation: How Do You Identify Light Duty Positions? The treating physician just issued a light duty restriction - Do you know what to do? We will show you a three step process to identify light duty positions. Part 1: 6 Essential Pre-Injury Policies. An effective return to work program starts before the injury happens, not the day the employee files the Notice of Injury. This webcast will examine the 6 essential preinjury policies that must be in place to prevent the "No one told me to come back to work" symptom. Workers Compensation: Can Injured Employees Return to Work? Can Injured Employees Return to Work Successfully? When treating physician issue return to work notifications, employers must have a plan in place to get the injured employee back to work immediately. Do you have a well defined Return to Work Program? Are you leaving it up to your insurance carrier to get the employee back to work? Workers Compensation: Ouch! I am Injured - Now What? When employees sustain occupational injuries do you know what to do after you provide them with medical treatment? Do you have a plan to effectively manage the injury? Learn the 4 essential post accident procedures that every employer must have in place.